New year is a very important period for jinja, and in Japanese culture more broadly. It is the only time of the year that almost everyone takes off, and a shop claiming to be “Open all year, no holidays” means that they are open over the new year period; the sign may even include a note saying that they are closed in August. Most people spend the time with family, particularly with family they do not normally see. It is very common to return to the town in which one grew up, for example, which leads to congestion of all forms of transport. An important Shinto custom is hatsumōdë, about which I wrote last year. This year, I’d like to write about shimëkazari, one of the New Year decorations. These decorations are hung on doors, particularly the main entrance to a building, a few days before the New Year, and taken down a couple of weeks afterwards. The traditional dates for displaying them are the 28th and 30th. The 31st is too last-minute, and shows a lack of consideration, while the 29th, in Japanese, sounds like “two-fold suffering”, and thus putting your decorations up on that days is held to invite bad luck. They are taken down to be burned in a local bonfire, which is usually held somewhere between the 10th and 15th, depending on the region. The decorations are primarily made of rice straw, often twisted into ropes. This makes them similar to the shimënawa ropes that mark sacred spaces in jinja, and I suspect that this similarity is one reason for the name. The other elements are symbols of good fortune. Ours has a crane, for example, and shidë (the lightning-bolt paper strips) in lucky colours and patterns, as well as a “kingashin’nen”, (reverence and fortune for the new year) label. The sizes vary; ours is probably slightly larger than average, but only slightly. I would say that more than half of all homes put these up, and an even higher proportion of businesses. For most people, I suspect that it is just a traditional decoration. 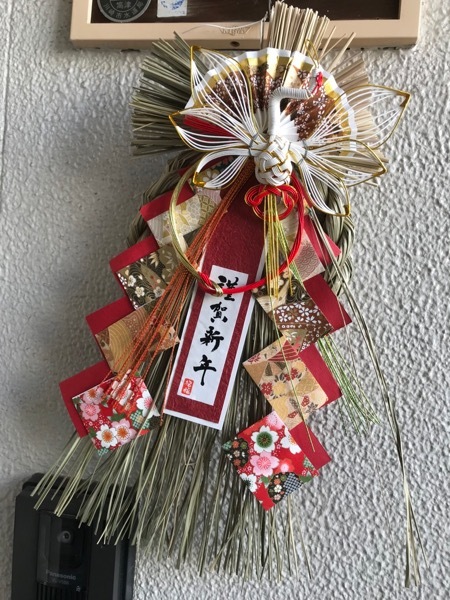 However, it is generally accepted that these decorations originated in the belief that, at New Year, a family’s ancestors came to visit them as the kami of the new year and the harvest, to bring good fortune. (The Japanese word “toshi” means both “year” and “harvest”. Thus, “Ōtoshi-gami” means both “Great Kami of the Year” and “Great Kami of the Harvest”.) The shimëkazari may originally have served as vessels in which the kami were to dwell while they were present in the house, or as markers of the boundaries of the sacred space in which the kami were present. It is not at all unlikely that both elements were merged in the process of the development of today’s shimëkazari. Thus, hatsumōdë represents going out to greet the kami in the new year, while shimëkazari represent welcoming the kami into you home as guests. Japanese new year involves a lot of visiting.